We hope you all had a wonderful Easter weekend. We spent Easter in California with Josh’s family. It was nice to be surrounded by family, friends, and of course tasty food. 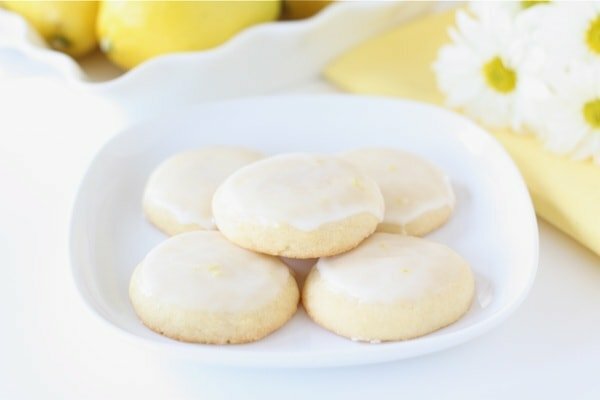 I hope you haven’t overdosed on Easter candy, because I have a sweet recipe for you today-Glazed Lemon Cookies. These cookies are light, refreshing, and perfect for spring. I make these cookies frequently during the spring and summer months. The cookies are soft and buttery with a hint of lemon. The lemon glaze adds a sweet and tart finish to these cheery cookies. 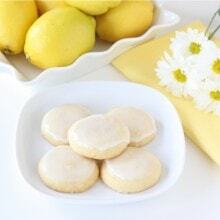 These glazed lemon cookies make a great dessert for picnics, bbq’s, and showers. I’ve made them several times for friend’s bridal or baby showers. Everyone adores them. 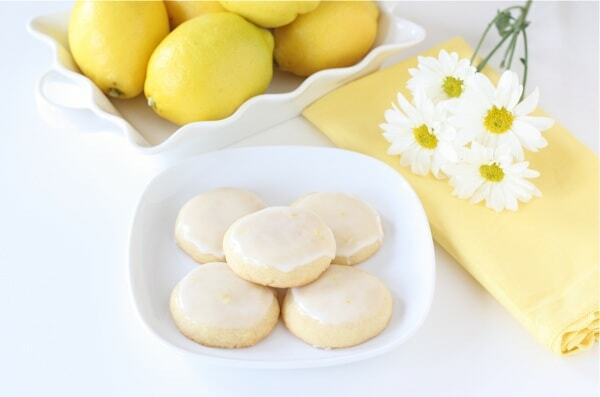 If you need to add a little sunshine into your Monday, make a batch of Glazed Lemon Cookies. I am sure they will put a smile on your face. Enjoy! Preheat the oven to 35o degrees F. Line two baking sheet with parchment paper or a silicone baking mat. Set aside. Combine flour, baking powder, and salt in a small bowl. Whisk and set aside. In a small bowl, add granulated sugar and lemon zest. Rub the sugar and lemon zest together with your fingers, until fragrant. Beat butter and sugar/lemon mixture together until light and fluffy. Beat in egg and vanilla extract. Mix until smooth. Slowly beat in flour mixture on low speed until blended. Drop dough by tablespoon onto prepared baking sheets, spacing 2 inches apart. Gently flatten dough with the palm of your hand. Bake for 12-14 minutes or until cookies are just set and slightly golden brown. Cool cookies on baking sheet for 2 minutes and transfer to cooking racks. Cool completely. In a medium bowl, whisk together powdered sugar and lemon juice. Dip each cookie top into the lemon glaze. Let cookies sit until icing has set. I love all of your lemon desserts. These look so refreshing and beautiful! So lovely you went out to California!! And I love those cookies – so refreshing. Maria, these look so delicate and wonderful and beautiful! these look like lemony heaven…they sound so good! Yum! I have a new appreciation for lemon desserts! I’ve been thinking about lemon cookies since the last time you posted some! Looks like I have a new recipe to try! More lemony yummyness- these look so good! Gorgeous Maria… really well done! These look like the perfect cookies! Lovely cookies, and I love the lemon flavor! They look so soft, buttery and absolutely delicious. Lemony desserts definitely always never fail to make me happy! These look so good! I absolutely love lemon. The glaze on these cookies is a wonderful addition! These look awesome! Lemon is my new favorite ingredient; I’ll have to try them. These sound like the perfect spring time cookie! Lemon is one of my favorite ingredients this time of the year! A lemon cookie can never be wrong. So glad you shared the recipe. I love lemon! What appeals to me most in this recipe is the glaze. I can only imagine how delicious it really is. I was taken aback to see that lemon is so popular-my lemonade is the most viewed post on my blog. I think that’s a little nuts! Hope you had a wonderful Easter! They sound so light and buttery! These are a perfect way to celebrate the arrival of spring. These look just like spring! I love anything lemony. Sweet. These are perfect for Spring! these look delicious and refreshing. I love lemon cookies too. Funny I made some lemon drop cookies for Easter. These look so refreshing. Definitely could use a little of that on this gloomy day! These look phenomenal! 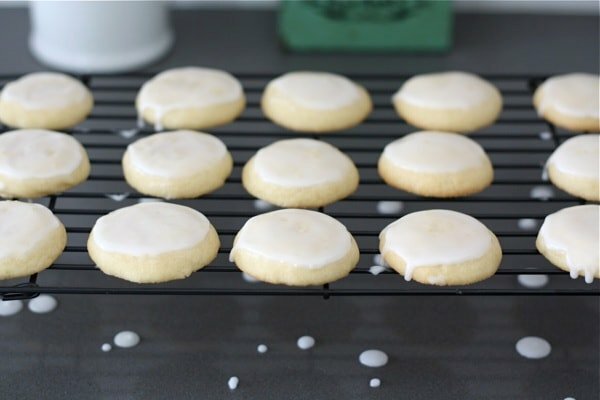 It seems that I can never have enough sugar cookies recipes – how fun to have a new one to try! Beautiful picture also, it makes my mouth water! I made them with orange zest and juice because that is what I had and they were delish! So pretty…and I bet they are delicious! You are my go-to place for lemon desserts! I think I’m going to make these for an upcoming wedding! Oh how beautiful! The perfect Spring cookie! I can’t wait to try them! Yum! So perfect for Spring! So fresh and perfect for spring – yum! I’m licking my lips after polishing off yet another one of these Amazing cookies. It’s definitely going in the “save this recipe” pile. 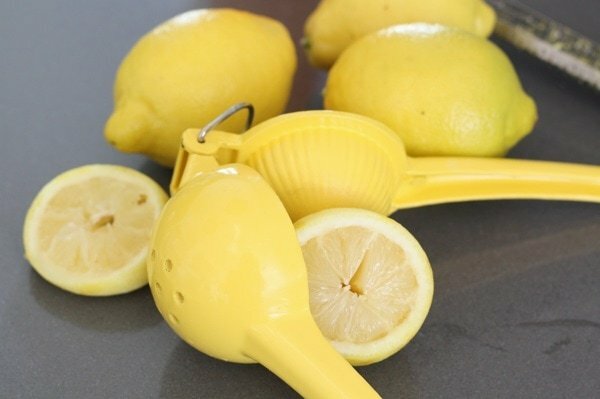 Perfect timing–I have a lemon in the fridge waiting to be used! These are wonderful! My 8 year old just had one and said “Jackpot Mom!”. I’ll be making these again for sure! Thanks for sharing. Lovely cookies! I adore anything lemony. What a great recipe! Cookies turned out fantastic! Thanks for sharing such a winner! These look fantastic! If only I didn’t have to go to work in a few minutes, I might just go bake some right now. Suddenly I am craving a lemon cookie! How did that happen? Seriously, these photos are simply divine and I can’t wait to make the recipe. I just wanted to stop by your blog and say ‘hi’ 🙂 We met at the ICBN event in NYC earlier this year. Also, I just added you to the Better Recipes blogroll! (Yep, I am a bit slow…) Hope all is well! These look great Maria. I have a similar recipe and they are always tasty, yours look so pretty! Glad you liked the lemon cookies. They are good any time of year! WOW. That’s all that can really be said about these lovelies! 🙂 They are now a family favorite…my mom even woke up at 3 am craving them after I had brought them to a family party. I tried them with lime instead of lemon too…yummy! I think I may try all the citrus varieties for some fun. Thanks for sharing! So happy you liked the cookies! These cookies will be my newest addition to my home-baked Christmas gifts! My grandmother bakes a lemon cake with the same glaze, and I can’t wait to bake these cookies for gifts. (If there are any left) Thanks! I just made these cookies today. OMG, this has to be one of the very best recipes I have ever tried! Thank you for sharing! Yes! I freeze them before I put the glaze on. When I need them, I pull them out and let them come to room temperature and then I add the glaze. I made these for a baby shower and they were delicious! Just made them. They’re amazing! Just put four teaspoons of lemon juice into the glaze though. Five overpowered mine. I just made these today for my mom’s birthday, and they are SO good. I’ll be shipping them, and will see if they withstand the heatwave in the middle of this crazy summer. I also pinned it and got repins already. 🙂 Thanks a bunch! I used 6 tsp of lemon juice and it was soo perfect! I’ll be checking out your other treats here! Hi, I tried this fabulous recepy but it was to much liquid. So my cookies were flat ! Where could this strange phenomenon comes from ??? Pingback: Fresh Cranberry Lemon Cookies | Bake Break! These cookies were very delicious, everyone in my family simply enjoyed it. Thank you so much for this. Could you add a little food color to the glaze to make them more colorful, or would that mess up the composition & drying of the glaze? I haven’t tried adding food coloring, but it should be fine. I made these cookies for my knitting group tonight. They loved them and couldn’t stop talking about them. I thought they were nice and chewy, just how I like cookies to be. Made these and they turned out wonderful! Perfectly sweet and tangy at the same time. I added thinly sliced strawberries on top of the glaze and it added just a bit more sweetness and a cute look for spring. On the ones without strawberries I put a few pastel sprinkles. So cute and such a great recipe!! I made these cookies for my last family bbq and everyone loved them! Great for a summer sweet treat. I just have to make sure to make a lot more next time- they ran out really fast! I just made these cookies- they are the most amazing cookies I have ever made! I used freshly picked lemons from the lemon tree next to our house. Thanks for sharing this! Have been looking for a lemon cookie that I could turn into a tangelo cookie and use the tangelos from my tree. This is a good one. I doubled the recipe, used my 1 tablespoon cookie scoop and wound up with 100 perfectly sized cookies. I also forgot to flatten the second tray of cookies and they still came out just fine. Didn’t bother to flatten the rest. Thank you for sharing. Pingback: Menu Plan: Healthy on a Budget. These taste like a lemon bar in a cookie! Just one quick question…how did you get yours so perfectly round? Cookie scoop? No, I just roll them into balls! I made these yesterday and they were DELICIOUS!!!!!! I did have to add more lemon juice to the glaze- I think i used 6 teaspoons. made just shy of 3 dozen. YUM! THank you! These were incredible I followed the recipe to a T with the exception that I put some leftover lemon zest into the icing. Wow this is a keeper, thank you! I don’t eat white flour, can they be made with another kind of flour? I love lemon!! Thinking of making these for a bridal shower…can they be rolled out and cut into shapes? I haven’t tried rolling the dough out. Let me know if you try it! I would love to make these cookies, where is the recipe? Absolutely loved these cookies. Will make them over and over for years to come. New favorite. Thanks! They look so Yum fresh and delectable. These are going on my Christmas menu for the family, see what they say about them. Has anyone tried these gluten free? Thanks. Delicious! Perfectly flavored, moist and cheery! 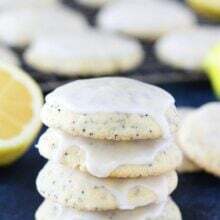 Reminded me of our grandmother’s Italian lemon cookies. I made them for Christmas, but will definitely make them for Easter as well. These melt in your mouth! Just delicious. Thank you for sharing. We all loved these, making another batch to take to visit family this weekend.! I have made these cookies several times now. They are always a hit. The glaze is the perfect amount and the lemon flavor is dreamy. These cookies melt in your mouth. 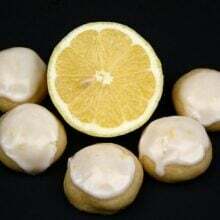 Thanks so much for sharing my new favorite lemon cookie and putting a smile on my face They definitely make any day of the week a little more special. Glad you like the cookies! Will these cookies freeze okay? I’m looking for an answer to this too! Hi! I can’t wait to make these! They look delicious!! Will the glaze set enough to be able to stack them for packing? Thanks! Did your glaze set. I need to know the same thing? These cookies are so good. The first time I made them I followed the instructions to drop by spoonfuls and flatten with my hand. Still tasty, but aesthetics were not the best. The second time I rolled them out and cut into even circles. They were prettier and had a better bake. I also added more zest than the recipe calls for and a bit of fresh lemon juice to the dough. The glaze is delicious and adds a nice tart note after biting into the cookie. Thank you so much for sharing such a fantastic recipe. I get multiple requests for it! I am so glad you like the cookies! I made these cookies today and they ate absolutely delicious. I’m usually not a big cookie eater but, I can’t stop eating these. These were delicious and easy to make. Really nice for a summer dessert. Hi there. Just wondering if these can be frozen with the glaze on? Yes, they should be just fine. Layer with parchment paper in between. Yes, you can freeze the cookies! This was delicious! First time making it for my book club and everyone loved it. A clear winner. Just add a little more poweeed sugar to thicken the glaze a bit. I meant to give it 5 stars, not 4! Made these for a cookie exchange and everyone loved it. Even won best cookie with them. I love them. And they aren’t too over powered lemon. My family loved these cookies and they were gone in no time! Super easy, I decorated my cookies with yellow sugar and white crystals. Dear TwoPeas: what is the best way to store these without freezing? I’d love to make them for Easter but I won’t be baking until Thurs-Fri and I fear they will stale by Sunday. Any storage pointers? Thank you and happy Easter! these were soooo good! thanks 🙂 i only got 2 dozen out of this batch though. Is it 2 and 1/4 cups or 2 x 1/4? I’m going to make these cookies for a teacher, but first I have a question- can I add some yellow food coloring to the glaze? These cookies look great and I can’t wait to try them! I added yellow food coloring to the glaze and made it pale yellow, looks super nice. I was bored and found this recipe and i love baking and tart flavor, so i thought why not? I made the and they were so easy! They came out an amazing texture and delicious taste! I definitely would recommend this recipe to any pro or amateur! Glad you enjoyed the cookies. I made these for a tea party yesterday and they were a huge hit. Thanks for sharing the recipe. If you like lemon, this is the recipe. Subtle lemon flavor. Not over powering. Delicious! I just made them for the first time and this will be one of the recipes I use for weddings, Christmas, all occasions! I haven’t made it yet but it looks good! Im in the process of making it! Super lemony and delicious. Great simple recipe! Easy recipe with a light lemony flavor. I added 1 Tablespoon of water to the batter. My glaze was a bit thin & I thought it would set, which it didn’t. However, a delicious light cookie. These are very very yummy and easy to make…. So good! Very light and fluffy. Yup, this recipe is a keeper. The hubby & kids really loved the taste & texture. The cookies came out so nice and soft, and just the right amount of sweetness to balance out the glaze. My glaze did come out a bit runny, so next time I will use a bit less lemon juice. I sprinkled pink sugar crystals on top. I have made these cookies SO many times. Absolutely amazing. I’m making them tonight for a “Friendsgiving” party, but I’m going to try a blueberry glaze instead. Hope it works! Hi! Would these cookies work with cookie cutters? Thank you! Is there any adjustment to recipe in high altitude? I’m at 6200 ft. Thanks for this recipe! Such a good flavor, lovely texture. I made these as Christmas cookies this year and they were a hit. These were absolutely fantastic! I added a lot more lemon zest and a tad less flour. I used cookie cutters to make the perfect round cookie. When I made the icing I added a tsp of butter and a splash of vanilla as well as 7 tsp lemon juice and a few tsp warm water. They turned out truly amazing. Thanks for the great recipe!! Cookies came really good! Light crunch on the outside with a soft center. Great lemon flavor! I’ll be honest, after getting the dough together, I was a bit skeptical because it was pretty crumbly. After baking these and getting the glaze on, they are absolutely delicious. I am saving this recipe and will definitely remake them! I have my grandkids over for dinner every Wednesday. 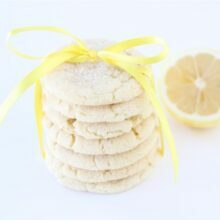 I made these for dessert and everyone said they were the best lemon cookies they ever had! My hubby said he was only going to sneak one earlier today after I finished making them…and said he ended up eating 3 more! Good thing I made extra so they could take some home. Glad the cookies were a hit! Such a satisfying recipe!! Everyone at my house and not coworkers who tried these cookies loved them! So soft and tangy with the glaze. Such a satisfying recipe!! Everyone at my house and my coworkers who tried these cookies loved them! So soft and tangy with the glaze. 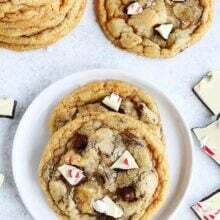 My friends and fam are always asking me to make these cookies…thank you! These are a tender cookie with a refreshing burst of lemon. Loved them and will definitely make again. WOW! Where have you been hiding all my life with this recipe?!? These are THE best cookies! I haven’t even put the glaze on them yet. I just wanted to test one ya know? And, WOW! These are SO mouth wateringly good(if that’s even a word)!